"PlayNow is the platform behind a totally new way for people to interact with brands at any event that has a big screen. Using the now ubiquitous smartphone users can instantly join in with an interactive experience shared with everyone in the audience. Previously this sort of interaction required users to download an app. PlayNow achieves all this in the phone’s browser and works on all major mobile OSs. " The Big Chip Imagination Award was created in 2008 to celebrate 10 years of Big Chip and 60 years since the invention of the stored programme computer in Manchester. The award is given to the most imaginative digital innovation of the last year coming from the North. Entrants must demonstrate exceptional imagination or innovation in digital media or digital technology. The entry should show how the project has used the opportunities offered by digital media and technology to create something new or original or to achieve objectives that would not otherwise have been realised. The Postcard Player is where cutting edge electronic ink meets music. The judges panel loved the combination of old world materials with new world technologies to create a fresh new way to play and distribute music. The Postcard Player has already been recognised by the Design Museum in London, and the Big Chip judges agreed it was one of the most imaginative digital designs of the past year. The emoto project captures and visualises the excitement around the Olympics in real-time - a window to the emotional drama of London 2012. For the first time in history we can read and make visible the emotion and attention of the crowd, the athletes and everybody participating, not just in the stadia, but all around the world. As the Games unfolded, emoto was processing Twitter data and analyzing the messages for content and emotional tone, which was then fed back to the viewer providing greater insight in real-time. After the Olympics, an interactive data sculpture made tangible the accumulated data. In 2013 this category was open to entries from anyone, anywhere. No one from outside the North of England has yet won. The criteria were revised in 2013 to reflect the new name which focuses on imaginative innovation. Photoswipe enables anyone to make galleries of images that can easily be scrolled through on a touch-screen smartphone. The judges praised the extremely straightforward and elegant code used, as well as the fact that it is free to download and easy to use for anyone with a mobile website, all factors that have led to Photoswipe being downloaded 40,000 times. Photoswipe (photoswipe.com) is first-of-its kind technology for adding a gesture-based image gallery to a mobile website. The full-featured image viewer offers users the ability to swipe items shown on mobile websites being viewed on mobile and touch devices (it also works on desktops). Plus other features include device orientation changes, automatic resizing of images, pinch" gestures to zoom, 360 degree rotate, slideshow options, and fade in/out effects. Created by Code, the team made it open source and free for others to download at www.photoswipe.com "
Open to entries from anyone, anywhere. This prestigious award was created in 2008 to celebrate 10 years of Big Chip and 60 years since the invention of the stored programme computer in Manchester. The award will be given to the best digital innovation of the last year and is open to entries from anywhere in the world. Entrants must demonstrate exceptional innovation in digital media or digital technology. The entry should show how the project has used the opportunities offered by digital media and technology to create something new or original or to achieve objectives that would not otherwise have been realised. The judges took some time to decide on the winner of this award, but they knew all along that a cheeky but extremely smart piece of work was leading the pack. They loved the audacity as well as technical capability on display, but what sealed it was the sheer humour involved. The Flash Vs HTML5 debate got us thinking. We believe the two technologies are not in competition and each have their purpose, but thought it might be interesting to actually put them in direct competition. 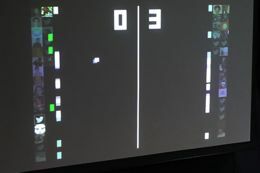 So this isn't a simple re-make of the classic game “pong”, the left side of the game uses Flash, while the right makes use of HTML5's Canvas.Word of the experiment spread virally through social channels resulting in more than 280,000 hits to the site (and rising) from over 180 countries, and received international acclaim from some of the world's most respected technology writers. 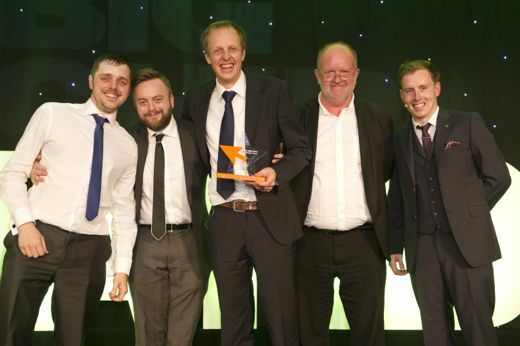 The winner of the Big Chip innovation category showed originality as well as innovation by creating a series of 3D characters and a be-spoke animation tool for CBBC to support the launch of a website for children, where they can discuss their own 'Bugbears' anonymously. The Bugbears website provides children aged 6-12 with a unique platform to talk about their issues, concerns, hopes and fears. The website facilitates anonymous self-expression in a deeply engaging way via richly, animated creatures which the children create themselves and which use their own voices. The process of creating a Bugbear is helpful for children - in that it encourages them to talk about things they might otherwise keep bottled up. All children can get involved in other ways to by supporting the Bugbears on the site, with empathy tools, comments and advice posts. This award was open to international entries but the most innovative and exciting new digital technology the judges saw was developed right here in the North West. It takes existing technologies and applies them to create a completely new user experience. And it's been designed to form the basis of a range of products.